To Cite: Goktas S, Sirin M C. Prevalence and Seasonal Distribution of Respiratory Viruses During the 2014 - 2015 Season in Istanbul, Jundishapur J Microbiol. 2016 ; 9(9):e39132. doi: 10.5812/jjm.39132. Background: Acute respiratory tract infection (ARTI) is one of the most common infections worldwide, causing significant morbidity and mortality. Objectives: This study was conducted to determine the prevalence and seasonal distribution of respiratory viruses in our region, in children and adults with a pre-diagnosis of ARTI. Methods: A total of 845 nasopharyngeal swab specimens were analyzed with the RespiFinder Smart 22 kit (PathoFinder BV, Netherlands) and the Rotor-Gene 6000 real-time PCR system. Results: At least one pathogen was detected in 612 (72.4%) of the specimens. Overall, 902 pathogens were detected; 821 (91%) were viruses and 81 (9%) were bacteria. The most commonly detected pathogens were influenza A virus (IFV-A) (n = 219), influenza B virus (IFV-B) (n=157), rhinovirus/enterovirus (n = 107), human bocavirus (HBoV) (n = 91), respiratory syncytial virus (RSV) A/B (n = 64), adenovirus (n = 56), human coronaviruses (n = 51), Mycoplasma pneumoniae (n = 49), parainfluenza viruses (n = 40), human metapneumovirus (n = 36), Bordetella pertussis (n = 15), Legionella pneumophila (n = 11), and Chlamydophila pneumoniae (n = 6), respectively. Among the 215 (25.4%) co-infected cases, IFV-A/HBoV and IFV-A/IFV-B were the most common co-infections. IFV-A was the most prevalent agent in all age groups except for children under 5 years of age, in whom RSV A/B was the most common pathogen. Approximately two thirds of the respiratory viruses were detected in early spring and winter, with peaks in January, March, and April. Conclusions: With regard to the prevalence and seasonal distribution of respiratory viruses, our epidemiological data for the 2014 - 2015 season in Istanbul showed a predominance of IFV-A infections with a peak activity in early spring. Enhanced surveillance and early detection of respiratory viral pathogens can be useful in the diagnosis, treatment, and prevention of ARTIs, and for guiding the development of appropriate public health strategies. Acute respiratory tract infection (ARTI) is one of the leading causes of morbidity and mortality in children and adults worldwide. The mortality rate is higher in children under five years of age, the elderly, and immunocompromised individuals (1, 2). The most common causative agents of ARTIs are viruses. Influenza A virus (IFV-A), influenza B virus (IFV-B), respiratory syncytial virus (RSV), parainfluenza viruses (PIVs), adenovirus (AdV), and rhinovirus (RV) are the most frequently reported viruses associated with ARTIs in the general population. However, their distribution varies by season, geographic region, and age group (3, 4). The clinical presentations of different pathogens, either viral or bacterial, are similar and therefore the accurate etiologic diagnosis of ARTIs relies entirely on laboratory investigations. Early detection of related causative agents is crucial for providing an appropriate treatment regimen, decreasing the use of unnecessary antibiotics, limiting the spread of infection, and shortening the hospitalization duration (2, 3, 5). Different laboratory diagnostic methods are available for determining the causative pathogens related to ARTIs. The conventional methods, such as viral cell cultures and antigen detection tests (such as enzyme immunoassays and direct fluorescent antibody tests), are effective and often complementary, but they have some limitations. Although the cell culture technique is considered to be the gold standard for virus detection, the process is laborious and time-consuming, and it is almost impossible to obtain results during the acute phase of the disease. Antigen-detection tests can provide more rapid results, but are less sensitive and/or specific compared to cell culture techniques (5, 6). Molecular diagnostic methods allow the identification of a wide range of viral and bacterial pathogens within hours, with excellent sensitivity and specificity. Multiplex real-time polymerase chain reaction (PCR) assays provide simultaneous amplification of several viruses or bacteria in a single reaction and make it easy to detect the common causative agents of ARTIs (5, 7). In addition, these tests are able to detect emerging respiratory viruses, such as human metapneumovirus (HMPV), human coronavirus (HCoV) NL63, HCoV HKU1 and human bocavirus (HBoV), which are difficult to grow in cell cultures (3, 8-10). The aim of this cross-sectional study was to determine the prevalence and seasonal distribution of causative viral agents over a one-year period in children and adults who were living in Istanbul and had a pre-diagnosis of ARTI. A total of 845 nasopharyngeal swab specimens were obtained from patients with a clinical pre-diagnosis of ARTI between September 1, 2014, and August 31, 2015. The specimens were transferred from healthcare institutions in Istanbul to Gelisim Medical laboratories, and analyzed directly or stored at -80°C until tested. The samples were analyzed for respiratory viruses and bacteria by using the RespiFinder Smart 22 assay (PathoFinder BV, the Netherlands). Each sample was simultaneously tested for the following 22 pathogens: IFV-A, IFV-A (H1N1)pdm09, IFV-B, PIV-1, PIV-2, PIV-3, PIV-4, RSV-A, RSV-B, HMPV, rhinovirus/enterovirus (RV/EV), HBoV, AdV, HCoV NL63, HCoV HKU1, HCoV 229E, HCoV OC43, Bordetella pertussis (BP), Chlamydophila pneumoniae (CP), Legionella pneumophila (LP), and Mycoplasma pneumoniae (MP). First, viral and bacterial nucleic acids (DNA or RNA) were extracted according to the kit protocol. Next, amplification, detection, and data analysis were performed with the Rotor-Gene 6000 real-time PCR system (Qiagen, Germany) according to the manufacturer’s instructions (11, 12). The statistical analysis was performed using Statistical Package for the Social Sciences (SPSS Inc., Chicago, IL, USA). Chi-square or Fisher’s exact tests were used for comparisons between groups in terms of categorical variables, wherever appropriate. A P value of < 0.05 was considered statistically significant. A total of 845 nasopharyngeal swab specimens from 309 children and 536 adults with ARTI were analyzed. The median age was 29 years (range 0 - 91 years); 444 (52.5%) of the patients were male and 401 (47.5%) were female. In 233 (27.6%) of the specimens, no pathogen was detected, while 612 (72.4%) of the specimens were positive for one or more pathogens (Table 1). The positive detection rate in children (232/309, 75.1%) was found to be higher than in adults (380/536, 70.9%), but the difference was not statistically significant (P = 0.190). Similarly, the positive detection rate in male patients (326/444, 73.4%) was higher than in female patients (286/401, 71.3%), but the difference was not statistically significant (P = 0.495). Overall, 902 pathogens were detected; of these, 821 (91%) were viruses and 81 (9%) were bacteria. Among the viruses, IFV-A (n = 219) was the most commonly detected pathogen (Table 2). Seventy (32%) of the IFV-A viruses were identified as the (H1N1) pdm09 subtype. Among the bacteria, 49 were identified as MP, 15 were BP, 11 were LP, and six were CP. The distribution of respiratory viruses in children (aged 0 - 15 years) is shown in Table 2. The detection rates of RSV A/B, AdV, and PIVs in children were significantly higher than in adults (all P < 0.05). In the 0 - 4-year-old subgroup, the most commonly detected viruses were RSV A/B (n = 26), IFV-A (n = 23), RV/EV (n = 21), AdV (n = 16), IFV-B (n = 14), PIVs (n = 13), HBoV (n = 11), HCoVs (n = 7), and HMPV (n = 7), respectively. In the 5 - 15-year-old subgroup, the most commonly detected viruses were IFV-A (n = 37), IFV-B (n = 29), RV/EV (n = 28), HBoV (n = 24), RSV A/B (n = 17), AdV (n = 17), PIVs (n=12), HCoVs (n = 11), and HMPV (n = 4), respectively. The distribution of respiratory viruses in adults (> 15 years old) is shown in Table 2. The detection rates of IFV-A and IFV-B in adults were significantly higher than in children (all P < 0.05). In the 16 - 64-year-old subgroup, the most commonly detected viruses were IFV-A (n = 112), IFV-B (n = 81), HBoV (n = 37), RV/EV (n = 36), HCoVs (n = 24), AdV (n = 17), RSV A/B (n = 16), HMPV (n = 13), and PIVs (n = 9), respectively. In the ≥ 65-year-old subgroup, the most commonly detected viruses were IFV-A (n = 47), IFV-B (n = 33), RV/EV (n = 22), HBoV (n = 19), HMPV (n = 12), HCoVs (n = 9), AdV (n = 6), PIVs (n = 6), and RSV A/B (n = 5), respectively. Co-infection was seen in 215 specimens, with detection rates of 25.4% (215/845) of all specimens and 35.1% (215/612) of positive specimens. Co-infection was more common in male patients (124/444, 27.9%) than in female patients (91/401, 22.7%), but the difference was not statistically significant (P = 0.081). The co-infection rate in children (84/309, 27.2%) was found to be higher than in adults (131/536, 24.4%), but the difference was not statistically significant (P = 0.378). The distribution of co-infections is shown in Table 3. The most frequently detected co-infection combinations were IFV-A/HBoV (n = 26) and IFV-A/IFV-B (n = 20), respectively. IFV-A/HBoV co-infections (n = 20) in adults and IFV-A/IFV-B co-infections (n = 8) in children were the most common combinations. Among the respiratory viruses, IFV-A (133/219, 60.7%), RSV A/B (36/64, 56.2%), and IFV-B (82/157, 52.2%) were more commonly detected as single pathogens, whereas AdV (46/56, 82.1%), HCoVs (36/51,70.6%), HBoV (59/91, 64.8%), HMPV (23/36, 63.9%), RV/EV (68/107, 63.6%), and PIVs (21/40, 52.5%) were predominantly detected in co-infections. Among the bacteria, 17 MP, nine BP, seven LP, and five CP pathogens were detected as single pathogens, while 32 MP, six BP, four LP, and one CP pathogen were detected in co-infections. The monthly and seasonal distribution of respiratory viruses detected in 2014 - 2015 are shown in Table 4 and Figure 1, respectively. IFV-A, RV/EV, RSV A/B, AdV, and HCoV were seen throughout the year, with different peak months. The total detection rate of respiratory viruses was found to be highest in March (197/821, 24%) and April (105/821, 12.8%), and lowest in September (31/821, 3.8%). Seasonally, the total detection rates for respiratory viruses in spring, summer, autumn, and winter were 43.7%, 20.8%, 13.7%, and 21.8%, respectively. Among the bacterial pathogens, MP was more frequently detected in summer (22/49, 44.9%) and winter (11/49, 22.4%), LP was more frequent in winter (11/11, 100%), and BP was more frequent in winter (6/15, 40%). The co-infections were more frequently detected in spring (98/215, 45.6%) and winter (47/215, 21.9%) than in summer (40/215, 18.6%) and autumn (30/215, 14%). Rapid and accurate identification of the viral agents of ARTIs is critically important in order to initiate appropriate antiviral therapy and to prevent the overuse of antibiotics, nosocomial transmission, and lengthy hospital stays (7, 13). Molecular techniques with higher sensitivity and rapidity play a critical role in the early identification of respiratory viral pathogens, particularly during epidemics (13). However, the virus-detection rate varies depending on the specimen type, the method used, the working group, and when the study was performed (2). In our study, nasopharyngeal swabs were tested for 18 respiratory viruses and four bacteria by using a multiplex real-time PCR assay, and at least one agent was identified in 72.4% of the samples. This high positive detection rate is similar to the rates reported in other studies, in which molecular methods were performed (13-18). The results indicated that individuals in all age groups were susceptible to multiple respiratory viruses that simultaneously circulate in the community. Moreover, despite no significant differences, the detection rate of pathogens in children (75.1%) was slightly higher than in adults (70.9%) (Table 1). Previous reports suggested that positive detection rates (in the range of 30.9% - 96.1%) for respiratory viruses in pediatric groups were higher than in adult groups (19). Viral ARTIs have been suggested to occur more frequently in males (15, 20). Our data also showed a slight male preponderance (53.4%) among the positive cases, but the overall positive detection rate was not significantly different between male and female patients. Among the respiratory viruses, IFVs are some of the most important genera due to their epidemic and pandemic potential in terms of public health. IFVs can have different clinical manifestations, from mild upper respiratory tract infections to severe pneumonia resulting in death (21). In this study, IFV-A was the most commonly detected agent, both in children over 5 years of age and in adults (Table 2). In addition, the detection rates of IFV-A and IFV-B in adults were found to be significantly higher than in children. In contrast to our results, Javadi et al. (2) detected the most common agents as RV in the 0 - 4-year-old age group and IFV-B in the 5 - 50-year-old age group in Iran. In another study conducted in the United States, HBoV (in the 0 - 4-year-old age group) and RV (in the 5 - 50-year-old age group) were found to be the most prevalent agents (22). However, Ren et al. (10) and Liao et al. (23) found the most common agent in adults in China to be IFV-A, which was similar to our findings. These results support that the prevalence of respiratory viruses changes based on geographic region and age group. RV and EV are both members of the enterovirus genus, and the kit used in this study was not designed for the identification of these two viruses at species level. RV, once thought to cause only the common cold in children and adults, is now considered to be a major cause of lower ARTIs and asthmatic exacerbations (3, 15). In our study, RV/EV were the second most frequent agents following IFVs, comprising 13% of the detected viruses (Table 2). Similarly, Shih et al. (24) found the most common agent to be IFVs and the second most common to be RV/EV. Respiratory syncytial virus is known as the most common cause of bronchiolitis and pneumonia in infants and young children worldwide, and is divided into two subgroups, A and B, depending on the antigenic and genetic variety (3). In this study, the detection rate of RSV A/B in children was significantly higher than in adults, and RSV A/B was the most commonly detected pathogen in the 0 - 4-year-old age group. Our results confirmed the previous observations regarding the importance of RSV A/B in children under 5 years of age. In the current study, two or more pathogens were detected in 25.4% of all samples, with a higher rate in children and in male patients. In a systematic review, Goka et al. (19) reported that co-infection rates ranged from 5% to 62%, and RSV has been found to be the most predominant co-infecting virus in many studies. However, Zhang et al. (4) and Ren et al. (10) detected the most prevalent viral agents in co-infections to be IFVs and RV. In another study conducted in our country, HBoV and HMPV were found to be the most common co-infecting viruses (20). In this study, AdV, HBoV, HMPV, RV/EV, and HCoVs were more frequently found in co-infections, and the most commonly detected co-infections were IFV-A/HBoV and IFV-A/IFV-B (Table 3). It was reported that the high co-infection prevalence of AdV and HBoV may have resulted from asymptomatic persistence, prolonged nasopharyngeal shedding, or a tendency to infect or colonize in the presence of other viruses (9, 14, 18, 25). Similarly, Byington et al. (22) found that the detection of HBoV was not associated with clinical symptoms in 54% of cases. On the other hand, although nasopharyngeal samples were suggested to reveal reliable results for detecting viral agents, the findings described above may indicate that pathogen detection in the nasopharynx may not accurately represent the situation in the lower respiratory tract (14, 17, 18). Moreover, the possibility of contamination during sample collection or analysis could not be excluded, and this should be kept in mind in clinical evaluations. Assessment of viral load may be a better choice in the interpretation of positive co-infection results, but it has been reported that more studies would be required to clarify the potential value of quantitative test results (9). In addition, in most studies, it has been suggested that the presence of more than one pathogen in a respiratory sample did not affect the clinical presentation of ARTIs, but the relationship between co-infection and severity of disease remains debatable (4, 13-15, 19). It is known that viral ARTIs have a seasonal character, particularly in regions with temperate climates, and the peak periods may change from year to year. In many studies, respiratory viruses have been reported to be active during the cold seasons (generally from November to March) in the Northern Hemisphere (20). In our study, interestingly, IFV-B was not detected in the autumn months or in December; it began to appear in January (Table 4, Figure 1). In contrast, IFV-A was seen throughout the year, with peak activity in March and April. 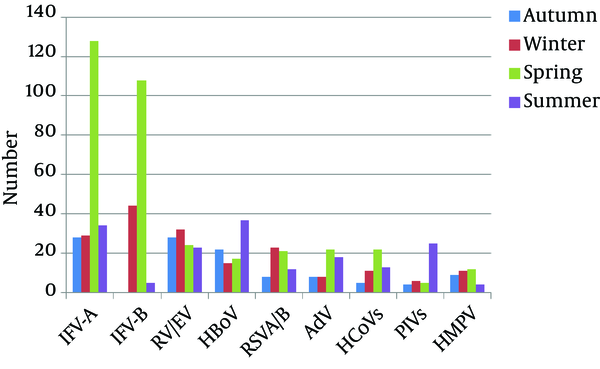 RV/EV was most frequently seen in the autumn and winter months, RSV A/B and HMPV in the winter and spring months, HCoVs in the spring months, AdV in the spring and summer months, and HBoV and PIVs in the summer months. The differences in the peak periods, compared to previous reports, could be explained by the smaller number of cases in our study (particularly for HCoVs, PIVs, and HMPV), regional differences, or annual variability, which has been demonstrated in other studies (13, 20, 25). Our study had some limitations that should be mentioned. First, we were unable to obtain accurate inpatient or outpatient data of the cases and thus we could not present the distribution of respiratory viruses according to inpatient and outpatient groups. However, most of our contracted healthcare institutions consisted of local outpatient polyclinics in Istanbul, and a high proportion of the samples may have been collected from outpatients and a minority from inpatients. Second, although multiplex real-time PCR assays are reported to have excellent sensitivity and specificity, there is a possibility of false-positive or false-negative results. As mentioned above, it may be difficult to diagnose whether a positive nasopharyngeal swab shows the etiology or evidence of nasopharyngeal colonization. Lastly, one year may be considered too short a time for an epidemiologic study, but we think that our preliminary data could provide useful findings for further investigations. In conclusion, IFV-A was found to be the most prevalent respiratory pathogen in all age groups except for children under 5 years of age, in whom RSV A/B was the most common agent. In our region, respiratory viruses were generally active in the early spring and winter, and the peak months for these agents were different from each other over a one-year period. Early detection and monitoring of respiratory pathogens is essential in order to avoid the unnecessary use of antibiotics, to control the spread of infection, and to contribute to public health surveillance efforts, and the multiplex real-time PCR assay could be a suitable and effective method in this regard. Authors’ Contribution: Study concept and design, acquisition of data, and critical revision of the manuscript for important intellectual content, Safak Goktas; analysis and interpretation of data, statistical analysis, drafting of the manuscript, Mumtaz Cem Sirin. Financial Disclosure: There was no financial support for this study. Funding/Support: There was no grant support or funding source for this study.